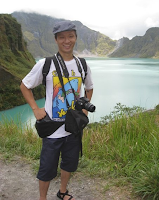 Renowned meteorite collector in the Philippines, Allen Yu, talks to Macrocosm Magbook about his fascinating hobby. How did you become interested in meteorites? It was mid-2005 when I read an article in Astronomy magazine regarding the hobby of collecting meteorites. The author enticed readers to try owning a piece or two, and feel the excitement of holding a piece of space in their own hands. Astronomy has its generations of visual followers, but a meteorite owner incorporates the sense of touch with a sense of awe. I was fascinated by this thought. I recall browsing through some meteorite articles before that but did not give any serious considerations about them. Initially, I was worried about the price, but after reading more I found out there are affordable specimens to choose from, and that was nice. The article mentioned a website: www.meteoritemarket.com, and later I thought that could be the coolest thing I’ve ever checked out. A marketplace! 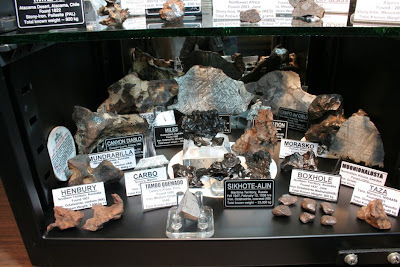 It’s like a supermarket where I get to pick something [a meteorite] I like and it will be shipped to me! I’ve been a good client of Amazon.com for some time now, so ordering from overseas through the Internet was not new to me. I already had a unique sense of collecting outrageous things—preferably from out of this world, and was happy to begin serving my astronomical interests with this new stuff. Meteorites fit the shoe perfectly, and while it had rung bells in my head, or at least raised an eyebrow, I believe it should ring bells for everyone else, too—for the sheer joy of owning and showing them off! When did you start collecting meteorites? So it was June 2005 when I ordered my first two pieces, a Sikhote-Alin individual specimen (left) and a Gibeon slice showing the classic Widmanstatten pattern unique only to celestial irons. Irons are an enigma, in a sense that meteorites should be heavy and dense, and the thought that iron rains from the sky had baffled my mind to no end. I counted days, then weeks, then almost a month—no meteorite in my mail! The dealer forgot to ship it! It was a good thing the dealer added a few baby Sikhote individuals to my order to pacify my restless heart and brewing temper. To release myself of the stress of waiting, I ordered the Encyclopedia of Meteorites from Amazon, which arrived even before the meteorites themselves. After three weeks and five days, a notice from the post office came to confirm that my registered parcel had arrived. It was perhaps the most exciting moment in my amateur astronomy career—I finally had in my hands a genuine iron meteorite! My imagination flew and I saw it in its journey in space, to its spectacular fall in Russia. I recalled pictures in the pages of astronomy books and magazines, and then there it was—a real piece for me to keep! To feed my new desire for meteorites, I needed to own some more. It’s an urge that continued to grow. But reality always kicks in, and I realized that owning becomes collecting, and collecting equates to sky’s-the-limit-spending! I made a pact with myself to stabilize my bank accounts and vowed only to order only 2 pieces every two months, to make a mere 12-piece-collection in one year. But it was to no avail. Since then, I’ve been hopelessly bitten by the meteorite bug. What is your most prized item in your meteorite collection? Goes without saying, that in every collecting hobby, you want the best your money can afford. You want to progress and upgrade. If you are a stamp collector, a Penny Black would be your centerpiece. Fossil collectors would die to own a T-rex tooth. I thought that after owning a piece of Mars named Zagami, I would be damned happy and stop the illusion of owning more, for I’ve reached the pinnacle of my interest. “Zagamis” carry a tag of US$1,000/gram, far outrunning gold in value. Buying two grams of the Zagami meteorite was a big decision to make; it’s what separates a meteorite connoisseur from the casual astronomer. Owning a Zagami piece was my turning point, unfortunately [sic], to go big time! The price is, with no question, a big burden for any minimum wage earner and it took a huge chunk off my life savings. Recouping the “investment” is almost out of question, but I feel a good sense of pride in owning a piece of Mars! It is far better than having the more common Php90,000 sleeping in my bank account. Any limit as to how much you would pay for rare meteorites? The benchmark I’ve set in my vocabulary is the limit of US$1,000/gram for a rare, scientifically-important meteorite. No higher—to think that some commercial meteorites are “just stones” picked from the ground and relentlessly hyped to be given a ridiculous price tag and this does not necessarily reflect scientific value. The Sylacauga meteorite commands a whooping US$10,000/gram as it is the only meteorite known to have hit and severely bruised a woman on the hips. It is popular, yes, but it is of the ordinary type. Meteorites are important only to the informed, sad to say. The market limits itself to the more-informed few. That includes a number of crazy, stone-worshipping people. All that would add up to only about 10,000 to 20,000 collectors around the world. I personally would prefer to settle with common specimens enjoying a stable market price that had their own share of history. Have you ever gone out on meteorite hunting trips? So far, not yet. I had plans to visit the Bondoc recovery site in the Bondoc peninsula [in Southern Luzon, Philippines], but my colleagues and I still could not pinpoint the exact location of the find, and we still do not have good logistics for the trip. We want to be in contact with the people who were present during, or were witnesses to when the big mesosiderite was plucked out of the jungle to be shipped to Dr. Harvey Nininger (1959). Are there any meteorite impact sites in the Philippines you have seen? None yet. The vegetation discourages good identification of impact sites in our country. What is your opinion on local research being done on Philippine tektites? As far as I am concerned, the research stopped when Henry Otley Beyer published his books on the study of tektites. 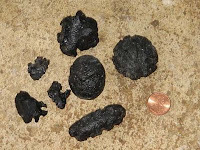 Occasionally, there are Internet links to tektites but most are written by casual hobbyists who are just happy to own a tektite and write something about it. Still, I’ve known foreign collectors who adore Philippine tektites and have written more technical content. But the theories are still generalized and knowledge of these black, glassy rocks come more from research abroad rather than from local ones. The fact that tektites are still referred to as “meteorites” by local dealers betrays the amount of understanding we had. Our National Museum does not present enough from its collection, but I know of a local dealer who has had field days selling absolute beauties that completely blew me away. This dealer had sold tens or hundreds of kilos of tektites to the tune of at least Php1.5M (US$31,250), to just one foreign collector. I know the good stuff are going out of the country by sacks, perhaps even by the ton, and their exportation is not even regulated. FYI: meteorites are not listed in the Customs Handbook, and there is no basis to apply duties/taxes on them. But the recovery story of the Bondoc meteorite had reportedly involved red-taped negotiations between the local government and the shipper. What is your own hypothesis on the origin of the Australasian tektites? I am not qualified to comment on this, since tektites are not my specialty. I have very little interest on tektites, since they are abundant here, and it is very easy to take them for granted. My interest and studies are biased towards meteorites. What advice can you give to people who would wish to collect and trade meteorites? Research, study, and look for the seal of authenticity. You can browse through the Internet to know the most popular and credible dealers. Subscribe to forums. The meteorite collecting fraternity is a small community worldwide, and once you get the knack of it, you will know you are in the right place. Avoid ebayers with questionable ratings. Ask questions, and look behind the curtain of the dealer you intend to buy from. There is an international organization that caters to the honest and authentic trading of meteorites: the International Meteorite Collectors Association (IMCA), of which I am a member. It has also become the authority of authenticity and confidence in the trade of meteorites, which means you can be assured that you are buying genuine stuff from its members. Most specimens, if not all, are simply circulating around this small community worldwide. Meteorites are not produced, they are simply bought, kept in collection, and when the owner can’t stand the sight of it in his/her collection any longer, sells it back into the market. Bigger or rarer specimens may be cut to serve a wider audience. If possible, seek provenance up to the 3rd degree. IMCA dealers usually offer their personalized specimen card for every item they sell. This alone would suffice. IMCA members are honest. They do not sell fakes or specimens intended to mislead or fool the buyer. How can a fascination for meteorites help in promoting interest in science? It opens up the universe to us, literally. Each specimen carries a story from space down to earth. If the specimen’s fall is well documented, we can recount its former orbit by studying its trajectory. To talk about meteorites you have to retell the story of the specimen, and that is a great educational tool wherever you go. Sure we can talk about dinosaurs, their sizes, their habitats and habits, but if I show you now a Spinosaurus tooth and say that this carnivore is bigger and more terrifying than the T-rex, would that not spice up the discussion even more? The specimen at hand is the key for better science appreciation. Nobody wants a replica. Geology is the most qualified course we have in our country where you can directly get involved in the study of meteorites. I remember seeing a geology teacher gape in awe at the sight of my meteorite books/magazines and specimens, and I knew very well she appreciated them very much. I would encourage geology students to give the same respect to meteorites the way they study earth rocks. Through the study of meteorites, geologists can reconstruct the story on how they formed; determine the minerals they contain—all of which point to the formation of the planets in our Solar System. If astronomers study things from afar without holding them, meteorites land a piece of what they study into your own microscope. How would you prefer it? I'll be having a meteorite display at the Manila Planetarium come June opening of classes . There you will find the biggest Sikhote-Alin and Canyon Diablo specimens in my collection. Also included are lovely desert meteorites with black fusion crusts from the Sahara. Meteorite photos courtesy of Allen Yu. Tektites photo is from the author. I have a meteorite and I want to sell it though I don't know what's the market value. Will you help me on this? Appreciate if you can. i have a few tektite collection, do you know what's the market value? i hope you could help me out. thanks..
Hi yoe yamada. I am looking meteorite specially bondoc. Please text me or call me. I have to identify my stone but i know its meteorite.. I already tested my supected meteorite and those test passed it..with the fll. 2.surface texture- color brown/dark brown/redish brown..
3.fusion crust-dark/black color in the outer layer of it. 4.magnitsm-yes it is magnetic in a magnet and magnet can pulled it. Does anybody know how to send a meteorite from Cebu to the USA?